Despite not being 100 percent fit, Lionel Messi came through 90 minutes following a week-long struggle with a thigh injury. There is a week before Barca’s next game — at home to Real Valladolid in La Liga — which gives him more time to get back to full fitness. Ousmane Dembele also returned from injury after missing five games. For the third game running, Barca were awful in the early exchanges; Valverde needs to ensure that doesn’t happen again with huge games coming up at Sevilla, Lyon and Madrid. Back-to-back draws with Valencia and Athletic, meanwhile, have allowed Madrid to creep back into the title race. The gap between the two clubs was 10 points 10 days ago. 6 – Valverde played it relatively safe with his selection, opting for the experience of Arturo Vidal to replace the injured Arthur and picking Messi despite his thigh problem. Barca looked tired and laboured and maybe a fresher, younger side would have been hungrier. That said, the coach’s substitutions, bringing on Carles Alena and Dembele, did not change much. GK Marc-Andre ter Stegen, 9 — Produced two more stunning saves for his ever-expanding showreel. For the first, he somehow propelled himself to the top corner to tip over from Susaeta in the first half and later displayed a concrete wrist to brilliantly keep out Williams. DF Sergi Roberto, 6 — Suspect at the back at times and was not able to link with the attackers as he often does. DF Gerard Pique, 7 — A solid performance against the very lively Williams. The veteran central defender has been a rock for a number of weeks. DF Clement Lenglet, 6 — Got a second-half booking for taking out Williams before eventually being taken off with a knock. DF Nelson Semedo, 6 — Played left-back in the absence of the suspended Jordi Alba and did OK. Replacing the Spanish international, given what he brings the team, is an almost impossible task. MF Sergio Busquets, 6 — Struggled in the first half against Athletic’s press but controlled things for large parts of the second period. He was also booked for fouling Williams. MF Ivan Rakitic, 6 — Worked hard and tried to play on the front foot, but his performance lacked a spark. 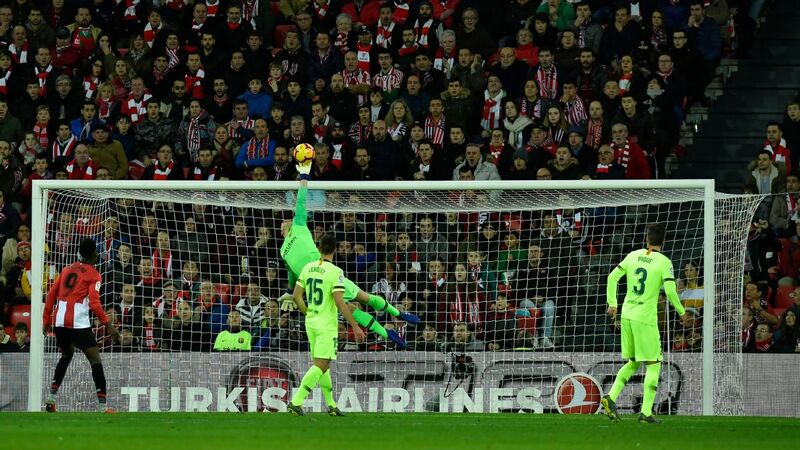 MF Arturo Vidal, 5 — Struggled to impose himself on the game, giving the ball away several times, one of which led to a great chance for Yuri Berchiche. Taken off on the hour. FW Lionel Messi, 7 — Not 100 percent but was still one of Barca’s more menacing players. Hit the bar in the first half, drew a clumsy save from Iago Herrerin and set up Luis Suarez for a free header at the far post. FW Luis Suarez, 6 — Another disappointing performance. He haded his best chance off target and continues to look short of the form he displayed before Christmas. FW Philippe Coutinho, 6 — Another night when he failed to do enough in attack. Barcelona were screaming for innovation further forward but the Brazilian did not provide it and was eventually replaced by Dembele. MF Carles Alena, 6 — Came on for Vidal with the aim of helping Barca take control of the ball but it did not really pan out like that. FW Ousmane Dembele, 6 — Returned from an ankle sprain for the final 15 minutes but was not able to make an impact. DF Thomas Vermaelen, NR — A late introduction for the struggling Lenglet.